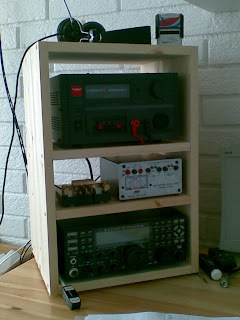 Today I finished making a pine box with shelves for my QRP station. On top I placed the Diamond GSV-3000 power supply. Bellow that I put the control box for the MFJ-1788x mag loop and the Kent twin paddle. At the bottom I made room for the Elecraft K3/10 QRP transciever. Wow, your shack is almost identical to mine! Same power supply, same radio (though I have the 100W PA in my K3), same antenna, same key. Main difference is my shelf is more horizontal than vertical and is made of good old British melamine faced chipboard not Scandinavian pine! Hi Julian. I decided to go for the MFJ mag loop after reading the review on your web page. The pine box was inspired by some pictures in the book QRP Basics by Rev. George Dobbs, G3RJV.